Here’s our farm family. We are a family of 4. Jason is 5th Generation Bundanoon Farmer, which I guess makes Alecia and Braedon 6th Generation on the land. They look after the property, guests and the cottages. 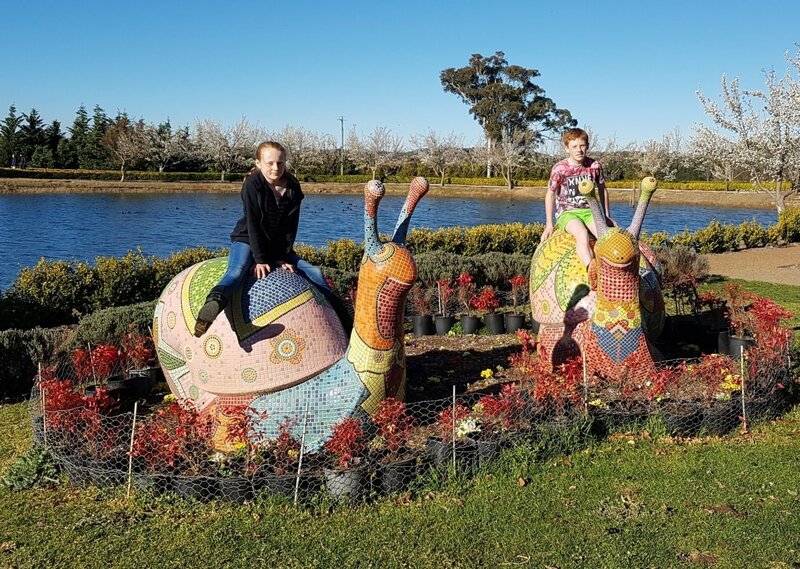 As for me – I’m Julie just a city girl from Eastern Suburbs Sydney, who moved to the lovely village of Bundanoon after having dreamed of a country life. Ever since my treasured childhood visits to Bingara – to my Grandparent’s farm. I look after enquiries, bookings and the marketing too! And so that’s what Morvern Valley Farm Stay is all about, offering city kids the chance to experience the country. 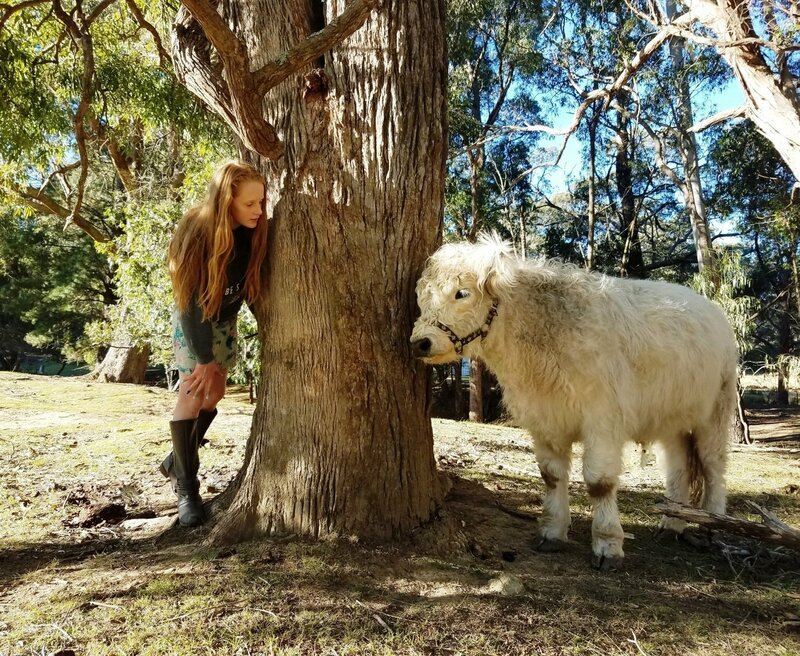 Meeting with lots of friendly farm animals, learning about life in early Australia – like what they might have experienced visiting their grandparents if they lived in the country like me…. Trouble is most Grandparents now live in the city too! So step outside your normal lifestyle – bring your whole family to meet our family, we have accommodation in 3 separate cottages for up to 24 at Morvern Valley. Large family groups often come. We don’t list with any directories or middle men so we can keep our costs down! When you ring us with your enquiry you speak to a ‘real’ person. Julie is really happy to talk about your group, their needs and which cottage might be best. 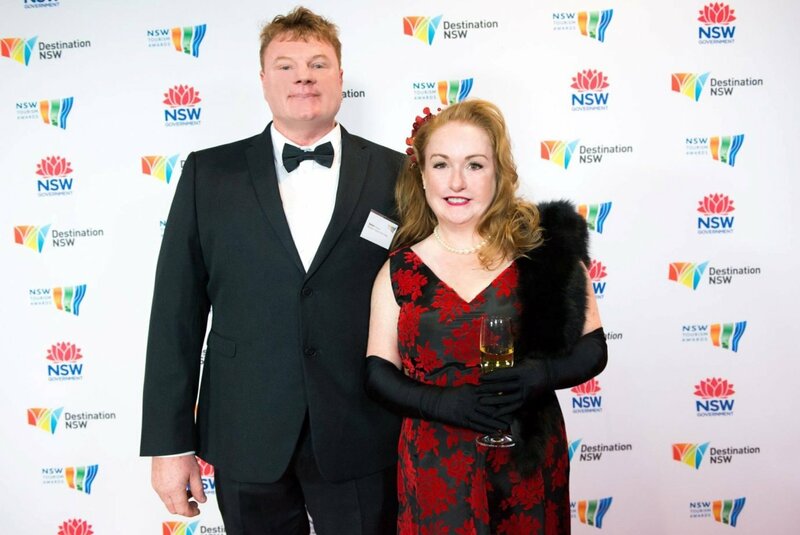 Morvern Valley Farm Stay was proud to receive a finalist award the NSW Tourism Industry Awards. Here we are ‘all gussied up’ in the official photo at the GALA event last November. It was held at Luna Park in the Big Top hosted by Kerrie-Anne Kennerley. There were over a thousand people there. Us country mice stayed in Kirrabilli for a few nights, we danced the night away with champagne and gourmet treats. We will be entering again this year FOR SURE!!! During the day we enjoyed the harbour, and really enjoyed all the city has to offer. Here’s Braedon with Jason whilst building our large chicken pen – each cottage has it’s own, we are passionate about our farm property and are always adding to ensure our animals and poultry have the best care. Jason makes automatic feeders and waterers so the animals have more than enough. 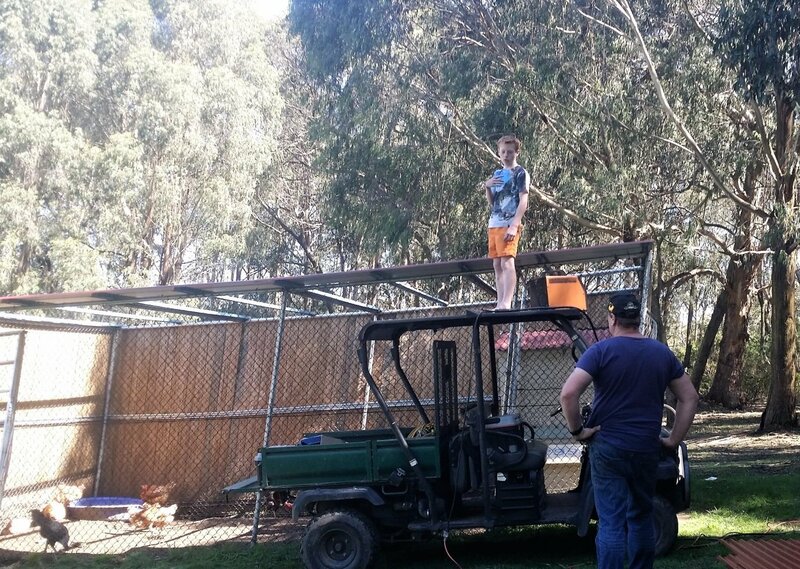 Braedon’s a senior at Chevalier College in Burradoo but always finds time to help us with what is needed at the farm. Here is Alecia, she trains the animals and works with all the animals giving a hand, driving the farm buggy – rounding up the animals, innoculations, shearing. This photo shows her playing hide-and -seek with Curly our mini galloway cow. Alecia is a natural with animals. She trained Curly all by herself every day after school going down into the paddocks. He even will rest with his head on her lap while she gently pats and talks to him. Braedon loves our farm vehicles, the tractor and motorbikes. 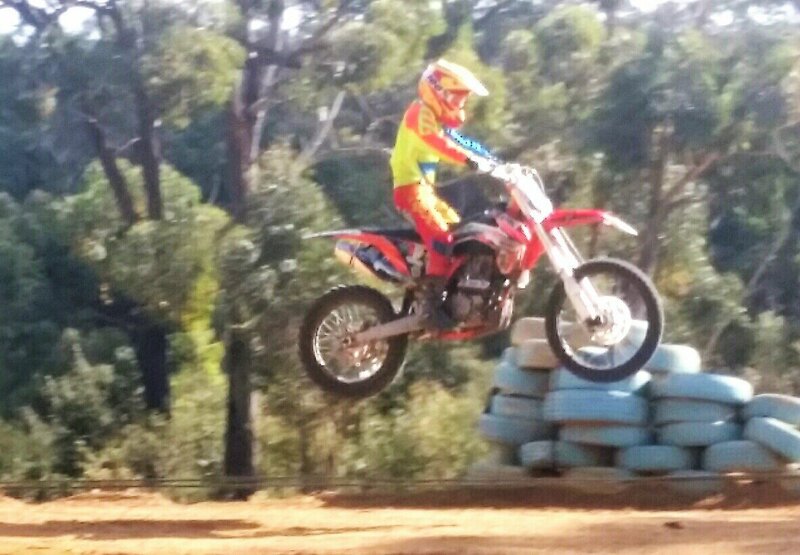 Here he is at Nowra Bike Track – he certainly can fly! Braedon delivers the complimentary breakfast baskets to the cottages, and helps bring Fudge to your cottage for your no charge ‘Up Close and Personal’ session with Fudge. He’s a gentle 25 year old miniature horse he stands just 33 inches high and loves all the attention (and the carrots and apples) he’s been doing it for 15 years! Here’s Alecia and Braedon at our families fave restaurant. It’s in Berrima, and only open for lunch on the weekends. It’s vegetarian (personally we aren’t, but with this really awesome food we could be tempted to change! YES it’s THAT good!) and called Zen Oasis. They have fantastic areas outside to walk, sculptures, paths and mazes. The theme of the property changes with the season. The restaurant décor too is really unusual, ever changing and interesting. It’s an all-you-can-eat Buffet. Its soooo popular we need to book a week in advance. Would you like to keep up to date with the behind the scenes animal and farm action at Morvern Valley then like us on Facebook and Twitter by simply pressing these icons.